WARWICK, R.I., Sept. 6, 2018 /PRNewswire/ -- InsureMyTrip reports an increase in calls today from travelers due to concern over the potential impact of Hurricane Florence. While it is too late to purchase traditional travel insurance to cover losses related to Florence, travelers may still be eligible for a travel insurance plan with the Cancel For Any Reason benefit. This is the first major hurricane of the 2018 Atlantic season. On Thursday, the National Hurricane Center said the hurricane was weakening but would likely restrengthen next week. The storm could pose a threat to the U.S. East Coast and directly impact travelers by late next week. Flights are grounded: Many plans may cover a traveler when common carriers such as airlines or cruise lines cease service due to weather. The cessation of services must be for a certain number of consecutive hours, usually 24-48. The resort is in the path of a hurricane: A few plans will cover a traveler when the traveler's destination is under a NOAA-issued hurricane warning within 24-48 hours of the departure date. While traditional travel insurance to cover losses related to Florence is now unavailable, travelers may still be eligible for a travel insurance plan with Cancel For Any Reason benefits. Also, travelers can still purchase comprehensive travel insurance for coverage unrelated to the hurricane, including emergency medical coverage, emergency medical evacuation, and baggage protection. Trip cancellation and trip interruption coverage are also available for covered unforeseen circumstances unrelated to the storm. 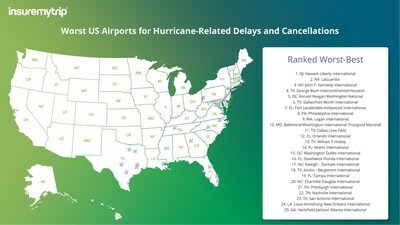 Travelers interested in learning more about insurance plans for travel during hurricane season can visit www.InsureMyTrip.com or call 1-800-551-4635 to speak with a licensed travel insurance agent. It's simple. InsureMyTrip finds you the right travel insurance plan, every time. InsureMyTrip is the authority on travel insurance. We are committed to empowering travelers to make the best possible insurance decisions by leveraging our technology, data intelligence, and expertise. InsureMyTrip is rated A+ by the Better Business Bureau.